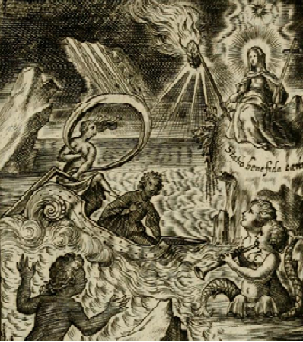 An early-seventeenth century engraver in the Southern Netherlands. From the beginning of the reign of Elizabeth I, English Catholics were forced to print their Catholic literature either abroad or at clandestine presses in England. English refugees and exiles used presses in Paris, London, Antwerp, but also in Douai and Saint-Omer, where the English Catholics had their own colleges and institutions. Nowadays, the latter towns are located in France. In the sixteenth and seventeenth centuries, however, Douai and Saint-Omer belonged to the Habsburg Netherlands. English Catholic exiles on the continent could fall back on their own printers in exile and even their own presses, but more often they joined forces with local printers. While collaboration between English Catholics and continental printers is widely known, the appeal the English made to local engravers has faded into the background. Martin Baes – also known as Bas, Basse or Bassius – is one of the engravers that collaborated with the English Catholics. For centuries now his name wanders through historical encyclopedias, even if almost nothing is known about his life and work. Albert Labarre, a French bibliographer, concluded that Baes must have been active between 1604 and 1637. According to Labarre, after that date there only appeared reissues of his older engravings. Most encyclopedias are convinced that the style of Martin Baes points to an Antwerp training. However, now and then he signed with “Martinus Bas [fe]cit Duaci”, which suggests that he had established himself in the university town of Douai. Most of Baes’s engravings were indeed printed at that place. Baes’s main activity was to make illustrations for religious literature. It seems likely that the English Catholics which gathered around the English College of Douai were familiar with his work. That they finally ended up with the Douai engraver is not too difficult to imagine. Possibly, the printer Charles Boscard arranged the actual contacts between Baes and the English refugee community. Boscard himself printed numerous books for the English and Baes worked with him at the very start of his career. Another possible relationship was with the English printer Laurence Kellam from Douai, who printed some of Baes’s engravings in the 1610’s. Sometimes, Martin Baes only supplied a decorated title-page or a portrait of the author. For example, he made a title-page for the press of the English Jesuit College of Saint-Omer, which was used in several editions. Of course, Baes had more to offer than only some title-pages or portraits. In 1614 he illuminated the life story, arrest and execution of the English martyr John Gennings (1566–1591) with twelve engravings. For this assignment, he had to immerse himself in an English story and to imagine a London setting, even if he had never set foot ashore in England. Curiously enough, while the rest of the book was written in English, the captions, also engraved by Baes, were in Latin. It seems that the Douai-engraver had little or no knowledge of the English language. So, even if he could not read the story of Gennings himself, he must have been informed on the fate of the English martyr through correspondence or other contacts with the English editors. Linguistic difficulties were apparently not an obstacle to make use of the services of local craftsmen. Baes’s engravings for the martyr story of Gennings were his first major contribution to the English Catholic editions. In 1632 he would be approached again to illustrate Jerome Porter’s compilation of the lives of English, Scottish and Irish saints. Continental printers that worked with the English Catholics only had to print a completed manuscript. Engravers, on the other hand, were in the position to make a substantial contribution to the English-language books. A craftsman fixed in Douai, such as Martin Baes, had to appeal to an English Catholic public. As a matter of fact, it was the continental engraver that was asked to guide the imagination of the English readership. It was through his engravings that English readers would form a picture of the life, arrest and execution of John Gennings. The case of Martin Baes thus shows how a shared loyalty to the Catholic religion created transregional ties, that crossed (linguistic) borders. * Albert Labarre, ‘L’oeuvre de l’illustrateur de Martin Baes à Douai’, Gutenberg-Jahrbuch 57 (1982) 270–276. * John Gennings, The life and death of Mr. Edmund Geninges priest, crowned with martyrdome at London (Saint-Omer: Charles Boscard 1614). * Christine J. Kelly, ‘Gennings, Edmund’, Oxford Dictionary of National Biography (Oxford: University Press 2004). * Jerome Porter, The flowers of the lives of the most renowned saincts of the three kingdoms England Scotland, and Ireland (Douai: s.n. 1632). Some of his engravings appeared in neighbouring towns as Saint-Omer, Arras and Lille. Albert Labarre supposed that there might have been prints of Baes’s illustrations in other towns of the region. A search through modern on-line catalogues quickly provides another twenty titles. The Short-Title Catalogue Flanders (stcv), for instance, associates his name with editions from Antwerp, Brussels and Louvain, which suggests that some of his engravings are still to be discovered.